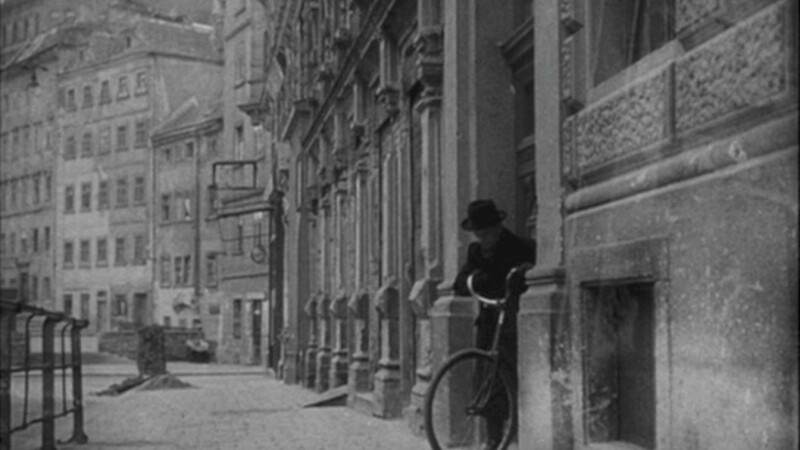 This ghostly image is an ominous portent of things to come: here, Dr. Winkel is preparing to bike to “the bridge,” a meeting point to which Popescu has called his cohorts (Baron Kurtz, Popescu, and the unknown Third Man are also en route) in order to address the situation with Harry’s former porter. Having foolishly informed Popescu that the porter saw the mysterious Third Man ushering Harry’s corpse across the street, Holly has unwittingly set in motion the machinery of murder. Holly, the self-styled cavalier vigilante, is in way over his head, only he doesn’t know it yet; soon, the repercussions of his solitary investigation will become clear to him. Popescu has also cryptically threatened Anna Schmidt, whom Jeremy aptly labeled “the only truly courageous character” in the film. The previous scene (Holly’s interrogation of Popescu at the Casanova Club) ends with Popescu pointedly eyeing Anna, sitting at the bar alone: “A nice girl, that,” Popescu intones in his half-Romanian, half-German accent. “But she ought to go careful in Vienna. Everybody ought to go careful in a city like this…” A jarring zither chord is struck and a montage, bridged by a series of dissolves, indicates Harry’s former cohorts preparing for their next deadly endeavor. This bridge is Vienna’s Reichsbrücke, which spans the Danube from Vienna’s Leopoldstadt to Donaustadt. (Interestingly, this bridge was the only one over the Danube that was not severely damaged during World War II. Earlier, in the 1930s, the Reichsbrücke was reconstructed as a suspension bridge in an effort to reduce the level of unemployment in Vienna—itself an indication of the economic woes that plagued the city before, during, and after the war.) 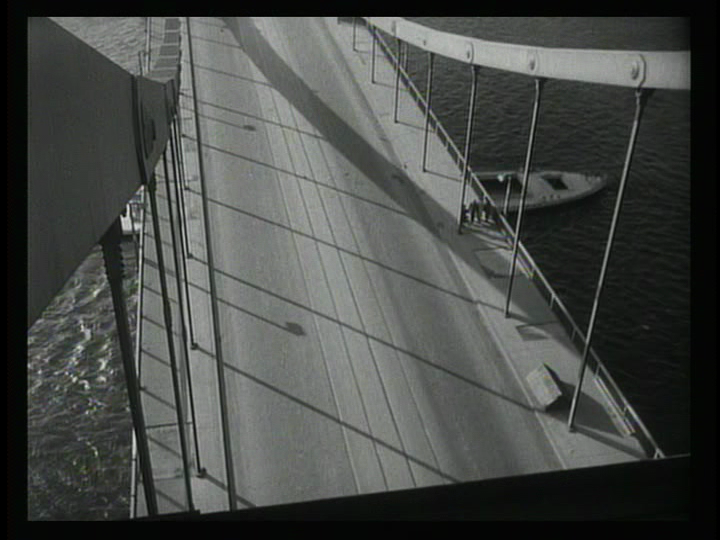 In The Third Man, director Carol Reed typically employs overt camera angles to add tension to moments of suspense and/or action. The canted angle is the most prevalent of these stylistic tricks, but the sudden cut from a street-level observational shot to this vertiginous extreme high-angle not only jars the audience into a heightened sense of alarm; it also gives the impression that these men’s behavior is pre-ordained or at least guided by larger sociopolitical or metaphysical forces—that they’re the victims, rather than the perpetrators, of their own destiny. 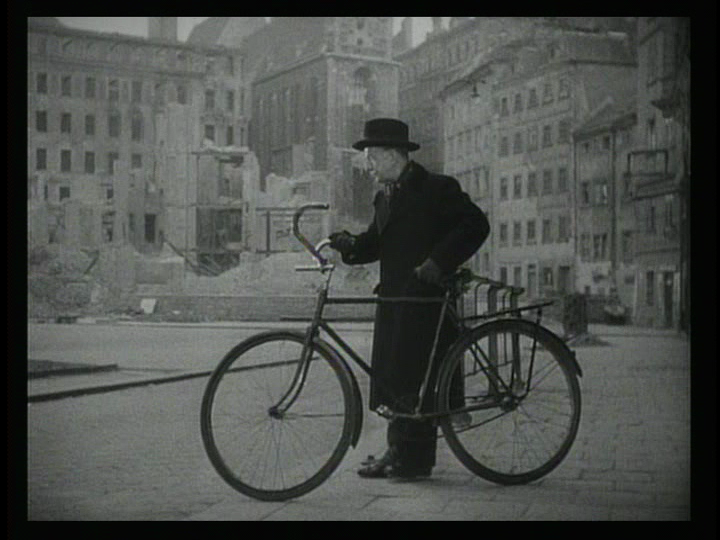 (Among The Third Man‘s many ideas is the sense that iron-clad notions of heroism and villainy aren’t always applicable to a turbulent world assaulted by war, nationalism, and capitalistic self-interest.) James Agee said of Carol Reed’s Odd Man Out that it “paints a melancholy, multitudinous portrait of a night city” (in that case, the city is Belfast); the same can be said about The Third Man‘s Vienna, a night city if ever there was one, which seems to have a tragic, almost preternatural influence over its inhabitants’ actions.